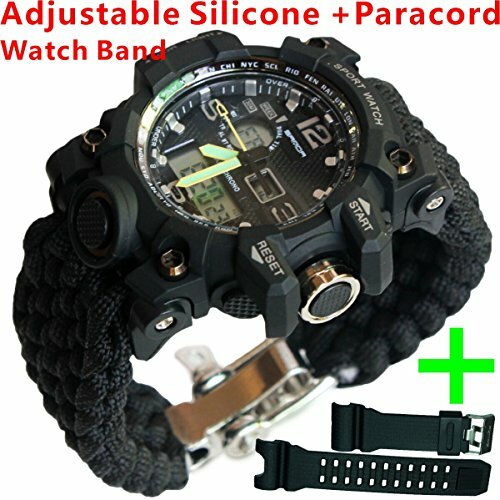 √Outdoor paracord bracelet Men's Digital&analog Sports Watches, 30m Water Resistant,Date&Day,Stopwatch,Chronograph,Alarm,LED Backlight. √1. attractive combination of sport and technological charm. √2. Advanced manufacturing technology, wear well and wear comfortable. √3. Clearance LCD mixing traditional analog display lets you know the time more accurately no matter where you are. √4. Stopwatch function is specialized for the YOU, who love sports. √5. Alarm function, day and date display. √6. EL backlight lets you know the time clearly in darkness. √7. Water resistant up to 30 ATM (suitable for swimming, diving, shower etc.,dont long stay in water). √Paracord survival bracelet is essential for all camping, outdoor and wilderness adventures. √Paracord survival bracelet increases survival chances by providing resources readily available on you. √An emergency kit or gear that you can take with you without packing heavy items or worrying about it getting lost as you have it on you at all times. √survival bracelet with watch design on the buckle. Unraveled paracord string: Essential for tying down and securing camping equipment or gear. √Best use: Mountaineering, Climbing, First Aid, Camping, Lashings, Adventures, Backpacking, Hiking, Cycling. The package will be shipped from China and the delivery usually takes 7-15 working days, your patience would be appreciated. If you have any inquiry, please feel free to contact us.